Abbiamo alloggiato in questa fantastica casetta durante un fine settimana di Maggio. Il gentilissimo proprietario è venuto a prenderci all'arrivo del traghetto e ci ha accompagnati all'appartamento. La casa al suo interno è accogliente e curata nei minimi dettagli, ma la sorpresa più bella è il fantastico terrazzo con vista mozzafiato sull'intero porto dell'isola. La posizione è ottimale, si ha tutto a portata di mano! Non potevamo scegliere alloggio migliore. Torneremo sicuramente con piacere! Soggiorno meraviglioso. La casa è deliziosa e la terrazza mozzafiato. Posizione comodissima, centrale ma lontana dal caos. Alfredo disponibile e gentile per qualsiasi evenienza, consigliatissima! Great location, fantastic views, value for money. I was a little concerned after reading a previous review but I would highly recommend this property and in all honestly give it a five star rating. It was clean and tidy and everything inside had been thought about with love and care. There was a blue and white nautical theme throughout. The bedroom was spacious and comfortable with lots of storage and whilst the ceiling is low (clearly shown in the photograph) we did not find that a problem and we are both over 5' 7''. We loved the little reading area on this floor which contained a fold out bed. The terrace, which wrapped around three sides of the roof, gave wonderful views of the port and we spent many hours watching the boats come and go. There was plenty of seating and extra chairs if needed. The dining area was under cover and could be protected from the wind or rain by pull down screens. We did not need to use this facility as the weather was wonderful.The kitchen had most of what you needed for simple self catering with a selection of pots and pans, a coffee maker and enough china and cutlery. Washing up liquid, salt and pepper and a few basics were provided. We would have appreciated wine glasses and a tea towel and we bought a sharp knife and chopping board. The bathroom was spacious, clean and tidy. Alfredo was very friendly and helpful and gave us information about the town- places to eat and things to do and information about ferries and ports before our arrival. Ponza is well worth a visit, the town is full of interesting shops and it was very easy to self cater. There were three fish shops and a butchers selling fresh meat and lovely roasted meats. Several small food shops provided a wide range of cheeses and breads as well as fruit and vegetables and there was a specialist wine shop. There was a huge range of restaurants and bars from basic pizza places to a one star Michelin restaurant (rather overpriced in my opinion). We enjoyed an all day round island boat trip and followed the historical trail. It was easy to walk to a number of surrounding villages and swimming from the local town beaches was good. There was a good choice of boat hire. 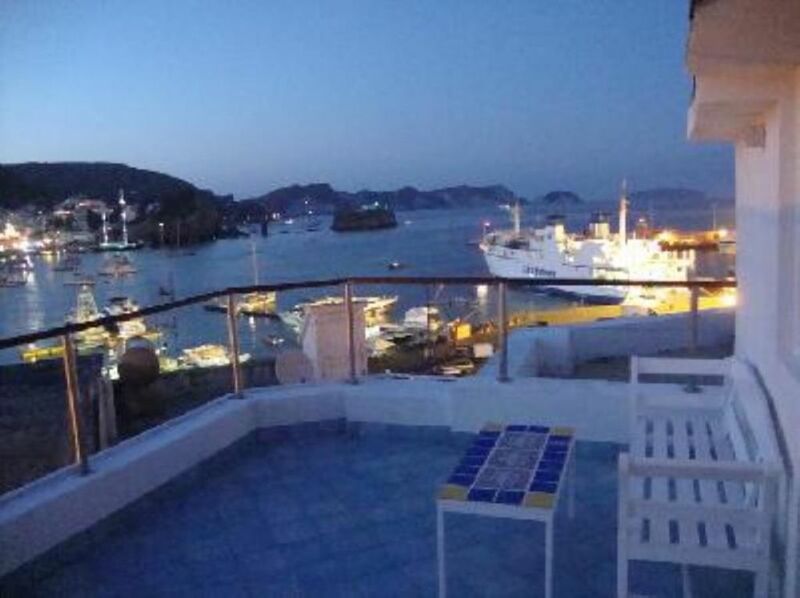 Ponza is a busy little island even in September and we enjoyed the "buzz" of walking around in the evenings trying out places to eat and drink and the calm of returning to the roof terrace to watch the lights on the water. I would highly recommend this island as part of a a two centre holiday. Thank you Alfredo, we would love to come back. The apartment is very well located! Everything is close by, shops, beaches, restaurants, port. This apartment has 2 floors. On the first floor is the bedroom, second floor the terrace, kitchen and bathroom. Everything on the second floor looks nice. The terrace is great! Unfortunately the first floor, the bedroom is worse than what you see in the pictures. It has Very low ceilings. My mom is 1.68m (5.6 feet) and she was hitting the ceiling every time when getting dressed . So if you are above 1.80m (6 feet), it's not the right place for you. The stairs are very steep, so if you have small children or you are senior also not the best place. Very uncomfortable when needing to go to the bathroom in the middle of the night. Also the place is very very basic! They don't even have 2 wine glasses, so if you'll want to sit on the terrace in the evening with a glass of nice wine, you have to drink it out of water glasses. Renovated a few good years ago, so not very fresh. Finally nobody cleans the place, or changes towels. If you stay longer than two three days be prepared to do laundry and cleaning. No internet (while you might think that you will not need internet because you are on vacation, you probably do not realize how much we rely on it; my parents had to go for every little thing (like finding out what time their ferry is, or train times) to a bar that had internet. Finally the PERSONAL website that the owner redirects you to is MISLEADING. The apartment on that website has only great reviews which do not fully correspond to the reality. Sehr schön liegt diese Wohnung direkt am Hafen und lädt vom Balkon aus ein, das emsige Treiben der Schiffe Tag und Nacht zu beobachten. Der Vermieter hebt sich in seiner netten und hilfsbereiten Art ab von vielen Ortsansässigen, die in ihrem Umgang mit Touristen vielerorts eher etwas weniger "accogliente" geprägt sind (vielleicht sind aber auch je nach Saison einfach zu viele Touristen auf der Insel, so dass sich dort über die Jahre ein solches Verhalten etabliert hat). Um den stark überteuerten Preisen in den Lokalen im Hafenbereich zu entgehen, haben wir viel selber gekocht und den frischen Fisch vom Fischhändler des Vertrauens genossen. Jederzeit würde ich die Wohnung wieder aufsuchen, wenn ein Aufenthalt auf Ponza geplant ist. Die Insel ist sehr schön und das Meer traumhaft.